Going on camping vacations used to be one of the cheapest ways to experience the great out doors. A few years ago, many primitive campgrounds were free on BLM land and in the US national forests. Some had nominal $3 fees which I gladly paid. Inexpensive primitive campsites are almost a thing of the past unless you know where to look and are prepared to rough it. In order to find cheap or free camping, you need to be self sufficient and bring your own things that paid campgrounds typically provide like water and a vault toilet. Let's face it, camping is getting expensive. Since I started family camping 8 years ago, I have seen national park campsite fees go from $6 to $18. Free national forest campgrounds that offer no amenities other than an outhouse from free to $12. Many national forest campgrounds have started using a private contracting company to manage their campgrounds. This is probably a good move, but has added another layer of expense to the. There is an alternative…it's called dispersed camping. Dispersed camping is staying overnight on public lands where there are no visible signs of a campground like picnic tables, water, and toilets. There used to be an awesome website, Eugene Carsey dot com. This guy detailed free dispersed camping sites all over the US. The site is long gone, but the legacy of free camping lives on. Free campsites are plentiful. The simple truth about free camp sites is that they do not look like a campground. There are no picnic tables, no bathrooms, and no water. You must provide your own water and other comforts that are found at developed campgrounds. You have to pack out what you pack in. To me, it's like back packing without the back pack. You get to carry everything in your car. If you need a bathroom, you can buy a port-a-pottie from Amazon or just dig a small hole and bury your download. My family has dispersed camped all over California, Idaho, Nevada, and Oregon. We like to focus on finding free campsites, having fun, being frugal, foraging for our food, and fellowshiping with other campers. But what you get is an awesome free campsite without RVs and noisy people. Nothing against RVs. I have camped with my retired parents many times in their motor home and really enjoyed it. Most BLM land and National Forest allows people to camp in dispersed undeveloped campsites. A good road atlas like the Benchmark Road & Recreation Atlas is almost mandatory for finding free camping. I find free camping by scouting out designated camping, picnic, and recreation sites found in the Benchmark Road Atlas near BLM land or the national forest and camp a few miles away from these sites. Dispersed camping is allowed unless posted. Check with each national forest regional office before camping to ensure that you are in compliance. The Bureau of Land Management (BLM) has thousands of campsites across the country. The only way to know where the campsites are is buy first finding out what area that you want to camp in. You can visit the website and drill down to the area that you will be visiting. Two of my favorite BLM campsites are Calf Creek and Deer Creek campgrounds in Utah. Both are located near the Grand Staircase-Escalante- National Monument. Both have a low fee and there is plenty of free dispersed camping near by. Calf Creek is exceptionally beautiful. The campground is tightly situated in beautiful red rock canyon with. You will hear the gentle rumble of Calf Creek all night as you sleep. The hike to Calf Creek falls is one of the areas prized hikes. Deer Creek campground is more remote and equally as beautiful because you drive through stunning slippery rock formations. Deer Creek campground is located inside Grand Staircase National Monument. The fee was $3 that last time that I stayed there. Legal. If the place is public, check with the local national forest, BLM, or other agency for rules about dispersed camping. Close to a water source for washing dishes if you plan on spending several nights. Level for setting up your tent or sleeping in a van. Beautiful scenery unless you are just stopping for the night to sleep. BLM open space land is one of the best kept secrets of the great outdoors. They purposely don't offer a lot of improvements to their land because they want the areas to appear as natural as possible. They advocate no-trace camping and you will be issued a citation if you abuse their limited rules and regulations. Have you ever heard of vanaboding? Jason Odom is the author of one of the most amazing ebooks about camping for cheap in a basic white cargo van. If you have not read my review about Vanaboding make sure that you click on the link. Jason goes into complete detail on how to live on $20 or so a day. He and his wife literally live in the van. Getting a good night sleep is as simple as pulling into a nice neighborhood or driving into the national forest and camp His van is set up as a hotel on wheels. Nothing beats fresh fish that you catch yourself. I don't consider myself an avid fisherman, but while camping, I bring a basic rod and reel to catch my own dinner. I spent a week in the back country near Yosemite and there is no way that I could pack enough food for a week. We had to catch our own dinner every night. We bought inexpensive rod and reel combos at Walmart for our kids and taught them the basics of fishing for survival rather than for sport. 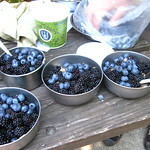 Wild berry foraging has become a major food source for us on camping trips. We plan in advance for the types of berries that we want to pick. Last year, we were able to pick wild black berries in Oregon. While camping near Lost Lake in the Hood River region of Oregon, we saw some campers picking wild huckleberries. This is an unexpected surprise. The berries were growing everywhere. Because they are tiny, it took a lot more effort than wild blackberry picking but was well worth the effort. Farm fresh produce is abundant if you travel on the back roads and byways. We actively watch for home made signs that advertise farm fresh eggs, fruit, berries, and meat. Last year we were able to buy raw organic whole milk. On one berry picking adventure we followed signs for pesticide free blue berries and ended up finding another farm that sold scrumptious organic blue berries. This year, my wife has researched extensively about picking wild plants to eat while camping and she will be writing about her adventures. Many communities have local farmers markets going on through out the week. Take advantage of getting fresh grown produce and cut out the middleman. If you are on a tight budget for camping equipment, then you are going to love shopping Craiglist.org, freecycle.org, and other online sources that offer used camping equipment for cheap or free. I bought my first Coleman 2 burner white gas stove for about $15 on Craiglist. The following year, I found a used roof top cargo carrier for $50. I am still using a free pressure cooker that we found on freecycle.org. People are always looking to rid of their junk. Post an ad on Craigslist that you are looking for certain camping equipment and that you will pick it up for free. Some people don't want to hassle haggling over a few dollars and having strange people coming to buy an old cooler or camping lantern. Tell them to drop of the items on a curb and you will pick them up. Large 4 gallon stainless steel water dispenser. If you plan on staying at dispersed campsites, then you are going to need a fresh water source. You may as well carry in as much as possible in a nice stainless steel water dispenser. I use a 25 liter liter water dispenser which is about a gallon and half larger than a 5 gallon stainless steel water dispenser. Additionally, I carry a Sawyer Complete water filter and a small MSR water filter. This is essential for my wife. She needs a place to sit comfortably. We bought our port-a-pottie at Walmart. These are easy to clean are nearly spill-proof. Never go dispersed camping without one. If you want to eat fresh food, then you need a good quality cooler. I bought an 80 quart Coleman Xtreme at Walmart. It will keep a block of ice frozen for days.